Got my Rift (CV1) a few weeks ago, no issues except a few disconnects. Was playing The Climb this morning when the game crashed. Oculus home was unresponsive and i force closed it in task manager. Now the Rift does not work. The orange light is still on, but there is no picture when i put it on. Everything is still shown as connected (HDMI, USB, sensors, touch) but i get a "Oculus Hardware Eror" when i try to run setup. Have tried reinstalling the Oculus software, Graphics card drivers. Also tried a lot of USB ports. which disappears after a few seconds. I can still sync my Touch, remote, and Xbox controller, but sensor tracking, guardian system, and set floor position results in hardware error. 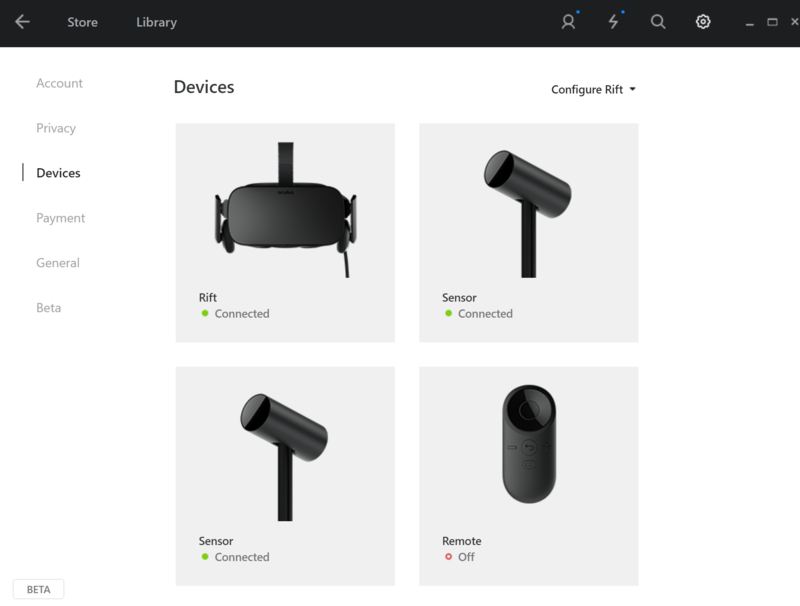 Have you tried doing a repair install of the Oculus setup? Reinstall your graphics card drivers with clean install option and reboot your computer. Also, you can also try updating to latest USB drivers for your motherboard and get Windows fully updated. Support has been great for me. Really fast replies. Thanks! They've been quick to response but pretty much one message per day but nothing actually happening. "Check connections" "Update drivers" then asked for serial and sales invoice. Once provided got the "We are looking into this for you and will update you as soon as possible." Good news! Got the go ahead that they will replace the unit. Bad news, 8-12 days from when they receive mine back with no eta on when I will have an RMA to send mine back, so 3 weeks on the short side. Better news is it was bought from Oculus on Amazon so returning it to Amazon instead, I already have a shipping label and expect to have a new one inside of a week. I hope they figure out why so many have this issue. So annoying. It amazes me the number of issues The Rift has had to this point. i have the same issue. Played a game and suddenly was kicked from the game and the screen went black. 5 days i was trying everything (fresh install of win10 also) and nothing works. I think its a defect of the hmd. Very frustrated because 5 days ago i bought the oculus touch controllers. Hope support will replace our oculus and that we will not wait month till we get them. There was a big Win 10 update a few days ago it's causing people with Oculus Rift's many issues. 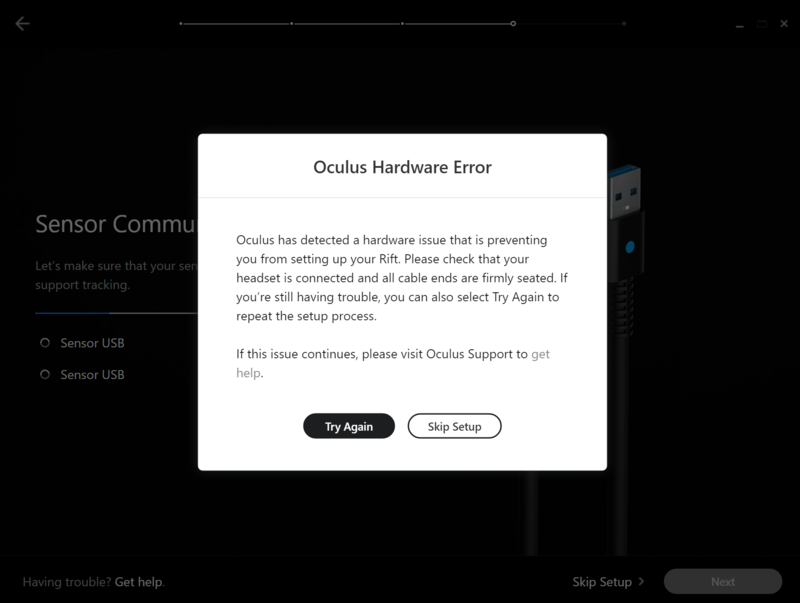 My Oculus CV1 was working beautifully up until friday (Apr 14th), when it all of a sudden stopped with black screen and orange light (just as reported abv.) 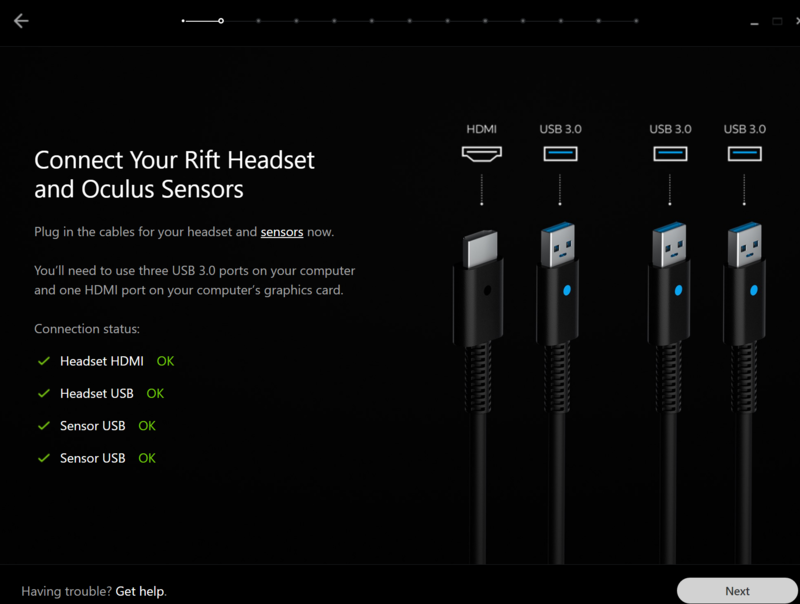 The Oculus soft does not detect the headset usb + HDMI or the sensor usb. Any help will be appreciated. Same thing just happened to me today as well. Please reach out to us and submit a support ticket. Thanks. Yes, please work with support on this. We may have to ask you to do some basic troubleshooting, but this is necessary to pinpoint the problem and either resolve it or replace the device if needed. Thanks for your patience. Opened a ticket with support following intermittent black outs and I can't express how good support has been. 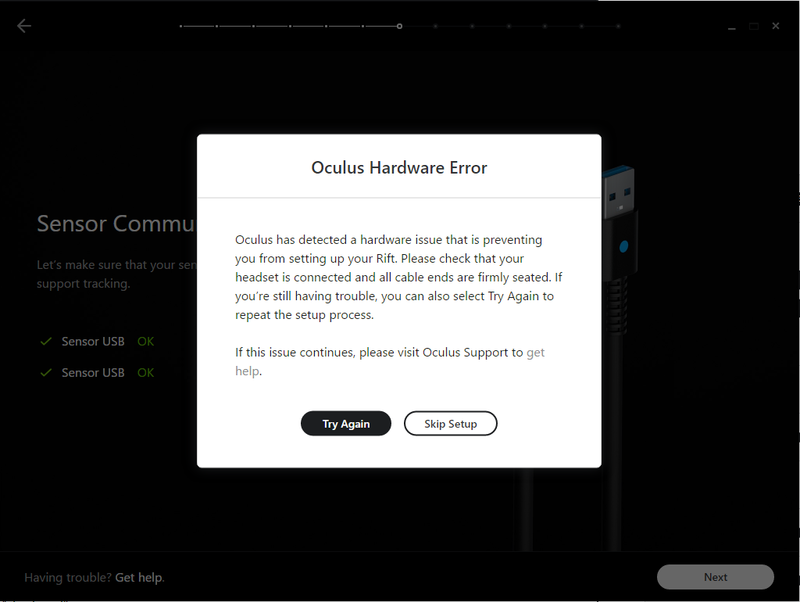 Well done Oculus and thanks for the great service. im having the same problem! I opened a ticket and the support told me to do update, reboot, plug in and out but to no avail. Nothing seems to work so he said to send the log files and now its the waiting game. I cant believe this many people were having issues its just insane. I have no clue if this might be related but, I had trouble launching controller software right after the Windows update. The issue turned out to be the newly released DotNetFrameWork 4.7; after downloading the install / removal tool and removing the update, the program stated working again. Simply using the Windows Update Uninstall did not work, I had to get the download for v4.7 and use the removal tool. Not sure I can help, but send me a PM and I will check on Monday to see if there is anything we can do. Thanks. Hardware problem? Firmware problem? or Sensor driver problem? I'd like to fix the firmware once. Is there no way?